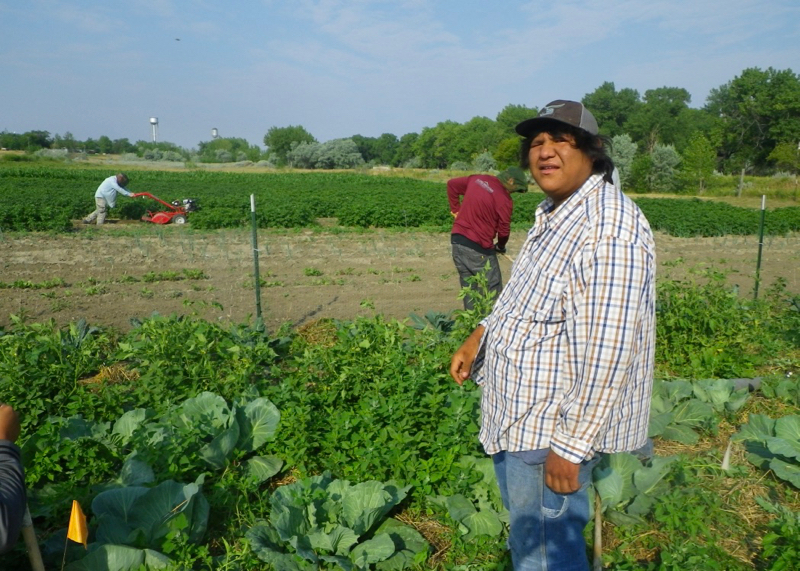 After a successful 2017 season, the Native Waters on Arid Lands (NWAL) Faculty-Faculty Research Partnership with Aaniiih Nakoda College (ANC) in Montana has received new funding from the U.S. Department of Agriculture (USDA) for 2018. This funding will allow for the continuation of a project that was piloted in 2017, in which NWAL team member Richard Jasoni, Ph.D. partnered with ANC faculty member Brian Grebliunas, Ph.D. and ANC student intern Joel Doney to develop a research project in a community demonstration garden. 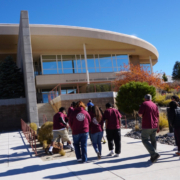 NWAL’s Faculty-Faculty Research Partnership pairs faculty from research institutions such as DRI with faculty from Tribal Colleges and Universities (TCUs) to develop and build capacity for research at Tribal Colleges. Goals of the program are to help establish new scientific research programs at TCUs, and to help students gain hands-on research experience that they can use to help local communities, pursue undergraduate or graduate work, or pursue any number of careers in their field of study. 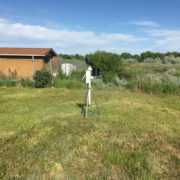 Student Joel Doney of Aaniiih Nakoda College researched irrigation application techniques during his 2017 summer internship with the NWAL research partnership program. The 2017 pilot project was designed to give Doney hands-on research experience by involving him in all aspects of the research study design, study setup, data collection, and data analysis. In the study, Jasoni, Grebliunas and Doney used the yellow onion (Allium cepa) as a test-species to investigate three research questions related to water use on arid lands: 1) Does reducing the amount of irrigation water application affect crop yield? 2) Does reducing the amount of irrigation water application affect soil moisture within the soil profile? And, 3) Does reducing the amount of irrigation water application affect soil nutrient content? Their study results showed that reducing the amount of irrigation water resulted in smaller crop yields, lower levels of soil moisture, and had a significant effect on soil ammonia availability. The reduced irrigation treatment was not found to have a significant effect on dissolved phosphorous levels. During the 2018 season, with new USDA support (grant 2017-38424-27076), the research team plans to continue to investigate the effects of water management on crop production. This year’s experiment will compare the effects of subsurface irrigation vs. aboveground sprinkler irrigation on soil moisture, soil nutrient levels and crop yield. “We hope that this research experience is valuable to Doney in his career – and that our study results will provide insight into water management that will be useful to the ANC community and anyone growing crops in arid regions,” Jasoni said. 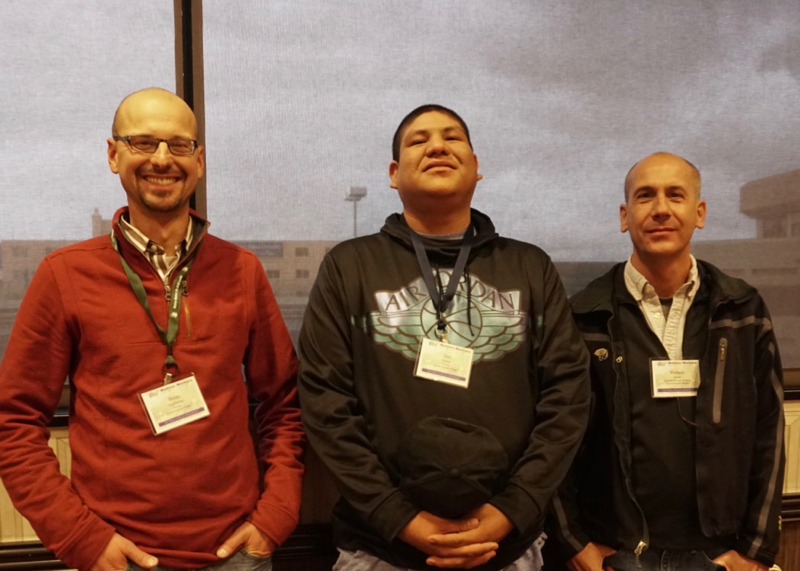 Brian Grebliunas, Joel Doney and Richard Jasoni at the 2017 NWAL Tribal Summit in Sparks, Nevada. November 2017.